Secondary ion mass spectrometry (SIMS) provides elemental and isotopic analysis of very small volumes situated on the surface of solid samples. 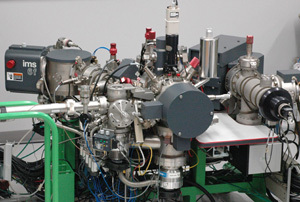 Operated in dynamic SIMS mode, an energetic primary ion beam sputters ions and neutrals from the sample surface. Some of the sputtered material is ejected either as positive or negative secondary ions. Therefore, each point of the surface becomes a source of secondary ions that are characteristic of the elements or isotopes found in the near surface region. These secondary ions are further mass analyzed in a magnetic sector mass spectrometer. By rastering the primary ion beam, a distribution map of elements and isotopes from the analyzed region of the sample can be obtained. This technique is inherently “destructive” due to the collisional interaction of the primary ions with the sample, although the extent of the surface damage can be controlled by an appropriate optimization of the parameters of the primary ion source. The dynamic SIMS (D-SIMS) mode is characterized by the use of high density, DC primary ion beam currents providing typical sputter rates in the range 0.5-5nm/s. Under such conditions most chemical bonds are broken and only atoms or polyatomic fragments are ejected from the sample surface as neutrals or ions, thus restricting D-SIMS applications to elemental and isotopic depth profiling or mapping. The detection range of this technique extends from matrix element levels down to trace element levels in the ppb range. Many upgrades to original instrument including, faster counting system, post acceleration, custom enhanced imaging system, new computer/software control, etc.